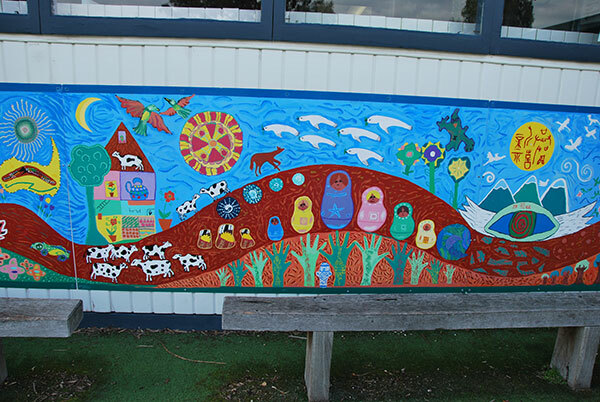 The outdoor spaces at Noble Park Primary School are recognised worldwide for their innovative approach and aesthetic beauty. With a forest area, dry creek river bed, large oval, tennis courts, sandpit, veggie gardens and playground, the areas encourage student’s imagination and physical activity. Our indoor spaces are equally inviting and inspiring with plenty of colour, communal areas and open spaces to come together. Our 3 Learning Houses are designed to create small communities within the school and enhance the learning for every child. Whether your child enjoys learning socially within a group or prefers a quiet corner to read and reflect there is a space to cater for them. 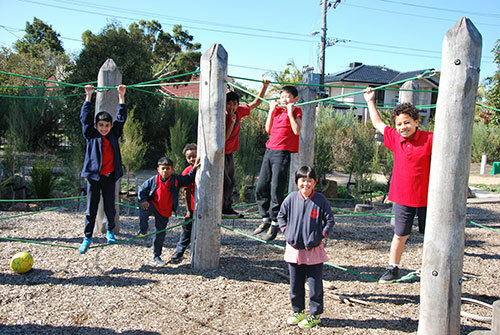 Noble Park Primary School has been one of the fortunate recipients of a Playpod. Over the period of time it has been located in our yard the Playpod has been transformative in the context of how children use the yard space and interact with one another. The Playpod itself is a shipping container which is filled with ‘spare parts’. It includes all sorts of factory off-cuts including wooden, plastic and materials (all quality controlled for safety purposes) with which children can let their imaginations run wild. The children build all manner of things, rocket ships stages, cars, beds, swings, slides; you name it they build it! This then leads to all sorts of imaginative games and role play. Most visitors comment that the children are playing just like we did when we were kids when all we had was our imagination and what was close at hand. The Playpod is a wonderful complement to the whole school philosophy about relationships, to one another, the environment and the curriculum. Our understanding of children learning through exploration needs to be lived in all aspects of school life and the pod allows that seamless flow from learning spaces to the school yard. Current research and practice tells us that students learn best in an environment which is rich in opportunities for experiential learning and caters for consideration of developmental factors. To that end our school has been working on practices which exploit those opportunities and mirror the practices which are proving successful in some of the highest performing educational jurisdictions such as Finland. The Playpod itself has provided endless opportunities for our students to interact in ways that are limited in the traditional yard. This is particularly supportive of a cohort of students where about 80% come from Non English Speaking Backgrounds and many of them have endured a refugee experience. There is no doubt that their school experience has been enriched and this extends to their orientation to school work and readiness for class after break times. In 2013 we embarked on the development of additional natural play areas to complement our abundant grassed areas, with a series of mounds interwoven with attractive landscaping and an ever growing kitchen garden. 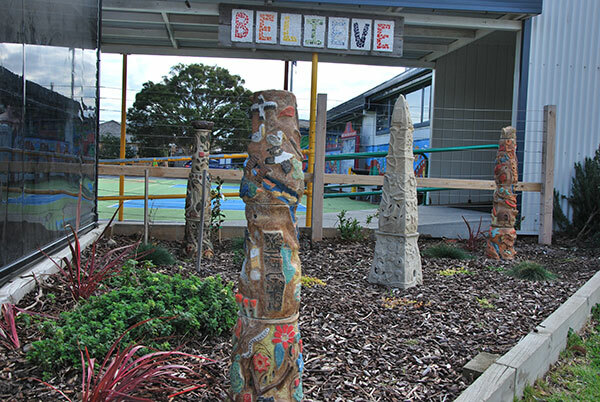 ‘The Forest’ is a large area at the front of the school which we have been vigorously planting with native trees and shrubs to attract children’s curiosity. Not to mention bird-life. We have filled the space with ‘natural spare parts’, limbs of trees, brush, logs, cut off disks of trunks and stumps with which the children construct a whole range of structures. As the forest develops it provides places for children to hide and run through and many opportunities to sift through leaf litter, look under logs to find bugs and explore mini eco-systems. Created in 2016 the Dry Creek River Bed has become one of our most popular outdoor play spaces. Spanning over 95 metres it features a log pyramid, ropes course, tree sheltered walkways, sandpits, rock hopping and bridges. 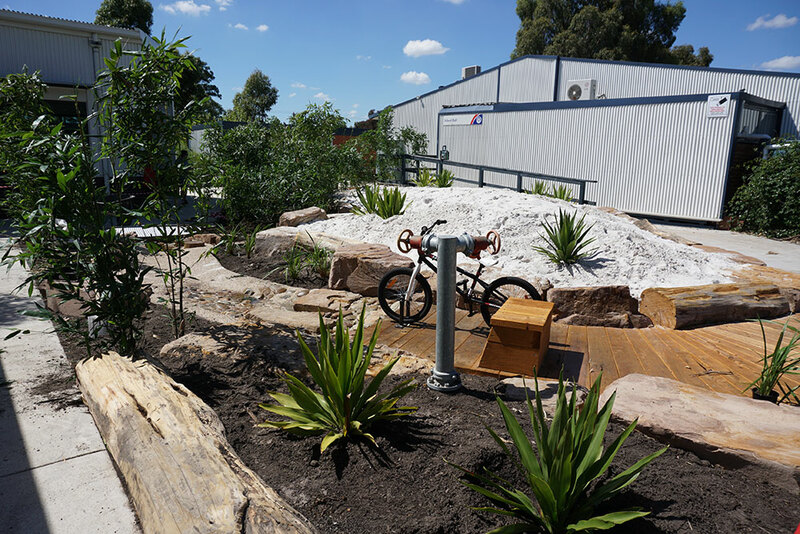 A feature of the Dry Creek River Bed is the blue water pump which enables students to experiment with water play sustainably with the water returning to the ground water.